Local societies are a boon to the family genealogist, be it the local historical society, genealogy society, or even a smaller group within the county/local area. Small towns within a county have historical societies as do some churches and other entities. Examples in Allen County are: Huntertown Historical Society; St. Louis Besancon Historical Society, with its French settlement preserves ethnic history along with its church history; the Four Presidents Corners Historical Society of Monroeville, Indiana preserves the history of Jackson, Jefferson, Madison and Monroe townships; St. Joseph Hessen Cassel Historical Society with its German settlers; the Fort Wayne African/ African-American Historical Museum; and the Mary Penrose Wayne Chapter of the DAR. There is a local SAR organization too. This is just a sample of local organizations that preserve our history from the ground up. How do you decide what records are the most important for preservation? The answer is "all of them." Our local history is found in court records, church records, school records, local published histories, family histories, cemeteries with their tombstones, landmarks, buildings, and even brick streets that haven't been covered with asphalt. Man-hole covers even tell tales. 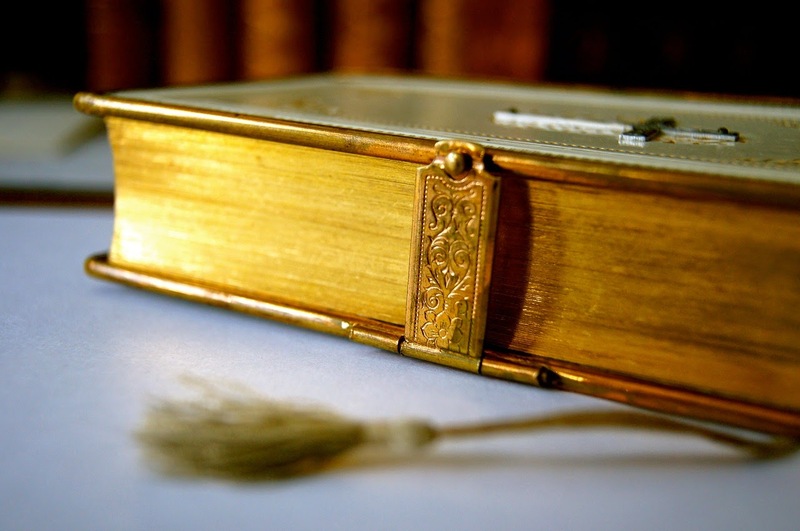 There are several ways to preserve records through the local society. Indexes can be compiled, published in one or more ways, and made available for research purposes. My local society read all the county cemeteries (1979) and published a seven volume set of this information. Each book contained an every name index. Twenty-five years later, a group was formed to create a "master index" using the names in these seven volumes and putting them on the Society’s web site for anyone to search. The local DAR society has a complimentary project because they have set a goal of photographing all the tombstones in the county and uploading the pictures to their web site. Mortuary records are a great resource. Although these are private records, some mortuaries are permitting the records to be copied. Judy Richter, the Indiana County Genealogist of Noble County, has made great inroads to collecting and preserving mortuary records of Noble County. In conjunction with the Allen County Public Library's Genealogy Center, the books are copied and a set is made for Noble County to be placed in the library, one set is made for the Allen County Public Library and one for the patron, in this case the mortuary. The mortuary people are very impressed with the final product. Funeral cards are another preservation project. The Allen County Genealogy Society’s web master requested funeral cards from society members so that he could digitize them and place online at www.acgsi.org. The one requirement is that they have an Allen County connection. There are now more than 2,000 cards in the collection. He then approached the local funeral homes and asked if he could get their funeral cards and one mortuary agreed if we would provide them with free advertising on our web site. First Families is a project that preserves family records of early settlers at the local county level. With a small fee, included with the application, the project can be self-sustaining. Allen County Genealogy Society did this in 1994 to coincide with Fort Wayne's bicentennial. The records were then indexed, microfilmed and placed in the Allen County Public Library. The index was also placed on the society's web site for research. A smaller county with limited funds might want to apply for an IGS grant of $500 to help with such a project. Local societies can help unlock and preserve the past. My great-grandfather, Oglesby Moore, was born in January 1888 to a Thomas & Isis Sweeney. When he was four years old, he was adopted by a Jackson Moore along with his half-sister, Gertrude. That's why my Mom's maiden name was Nina Moore. Grandpa Oglesby was born in Avoca, Lawrence County, Indiana, and my Mom & Dad were, too. I was born in Dunn Memorial Hospital in 1941in Bedford, and spent many summers there with both grandparents. My grandpa Moore worked in the fish hatchery and my other grandfather May in the stone quarries. We lived in Indiana until I was 6, but then moved here to PA. I have many cousins left in Bedford, but, unfortunately my Uncles & Aunts are gone. We can find nothing at all about Thomas Sweeney except that he was born in Illinois in 1848, making him 40 when Oglesby was born. The birth certificate says they were married but we can't even find that! Can you help? As a youth my uncle was either in the Muncie Orphanage or the State Boys School in Plainfield. Older family members can't agree.... Is there any way to find out? His name was Ermie Eugene Ellison and he was there between 1935- 1939. Thanks. Attendees of the 2015 Indiana Genealogical Society conference have another thing to look forward to -- extended hours at the Vigo County Public Library! The library, in conjunction with local host Wabash Valley Genealogy Society, will be open from 6:00pm-8:00pm on Friday, April 24, 2015. In addition, historian Tim Crumrin will give a short presentation on "Where Does Your Family Fit Into History." There will also be refreshments. The library is located at One Library Square, Terre Haute, Indiana (entrance off of Poplar Street between 6th Street and 7th Street.) Please be at the library before 6:00pm when it closes to the public. There's still time to register for the IGS conference, featuring Judy Russell, the Legal Genealogist. Register today! The Indiana State Legislature passed law S. 113 on February 28, 1913 that required every township school trustee in the state to enumerate annually all veterans living in their district. The law was classified as an emergency measure for some unknown reason. This was a year before World War One started and four years before the U. S. entered. What emergency? 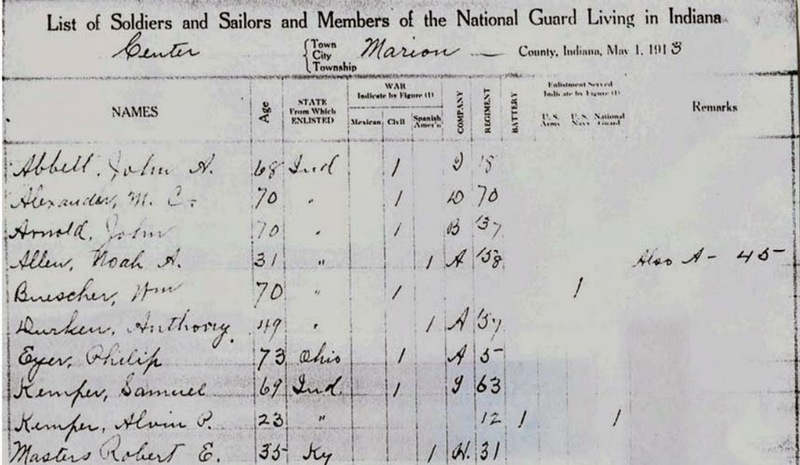 For the early years this meant veterans of the Mexican, Civil, and Spanish-American wars, plus anyone who served a term in the Army, Navy, or the Indiana National Guard. The later lists added World War I. The law was canceled in 1922. The Indiana State Archives has seven 16mm rolls of microfilm containing filmed record cards that the trustees completed and turned in to the state. The cards, arranged alphabetically by county then by township and by year, contain some great information. Some years are missing for various townships, so perhaps some trustees did not uniformly follow state law. Does that sound familiar? The cards additionally list the veteran’s age, state from which served, the company, regiment, and battery, and a remarks column with varying notes. All of this information was as of May 1st of each year. The Indiana State Library does not have the film and the State Archives states that the Family History Library does not either. If you've been wanting new databases for Benton, Morgan, Starke, Vermillion, or Warren Counties or a list of students from Wabash College, today is your lucky day. All of these are new Members-Only databases on the IGS website. IGS members can access these resources when they log in. Not a member? Join now! Searchable digital images from a 1914 booklet. This database was contributed by Ron Darrah. 45 seniors as listed in the school's 1954 commencement program. Searchable digital images from a 1915 history. This database was contributed by Ron Darrah. Searchable digital images from a 1913 history. This database was contributed by Ron Darrah. 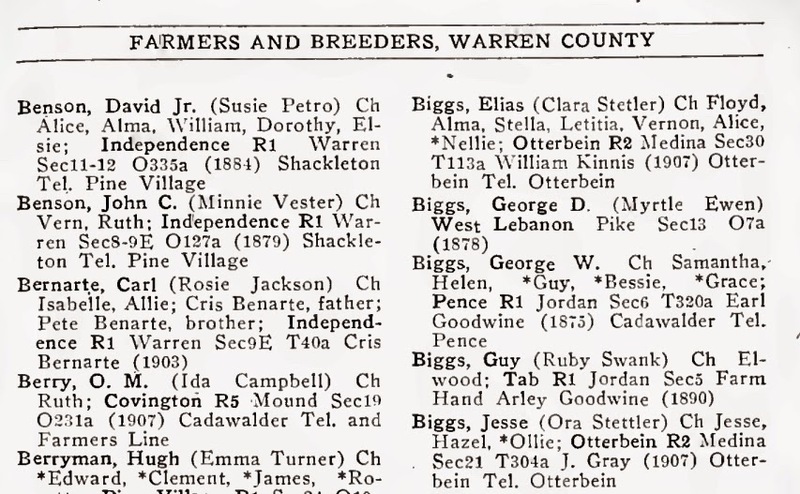 Searchable digital images from the 1919 Prairie Farmer's Directory, which includes the names of the farmer's spouse and children. This database was contributed by Ron Darrah. 500 students as listed in the school's 1922 yearbook, The Wabash. The yearbook includes information on the freshman class through the senior class. For the senior class, the students' hometowns and majors are included. From "Directory of Farmers for Warren County, Indiana (1919)"
Terre Haute really is the Crossroads of America. It is easy to reach, conveniently located on Interstate 70. It is within 3 hours of Chicago, Cincinnati, St. Louis, and Louisville. There are also sessions on DNA, Vigo County, and the Wabash Valley. You won't want to miss the vendor hall, either! If you want tips on how to improve your local genealogical society, join us for the Society Management Seminar on Friday, April 24. It is free for officers of IGS chapters and just $5 for everyone else. Registration through April 21 is $35 for IGS members; $45 for non-members. (You can join online through April 20 and get the member rate.) Registration at the door is $50. Register for the IGS annual conference today! We look forward to seeing you in Terre Haute! 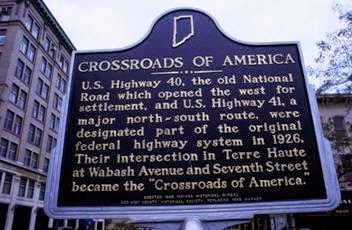 Terre Haute really is the Crossroads of America. John Welch died within two years of marriage, about when his daughter was 14 months old. Family memories are that his death was in connection with a train.